We spot the elusive leopard all the time at InnTheWild, right within our property itself, especially during our complimentary on-property moonlight drive. Well, here is a story where instead of me spotting the leopard, I was spotted by it :-). 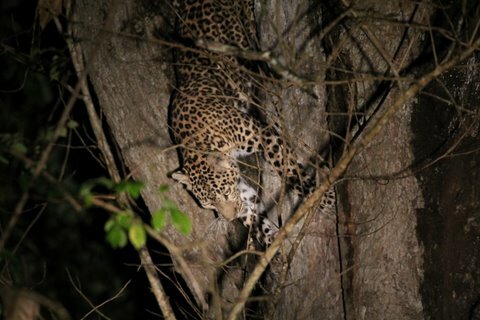 This behavior of leopard sightings in the buffer zones of the Mudumalai National Park near Ooty is common, because leopards tend to avoid tigers and so get pushed out to the fringes and into the buffer zone of which our resort is one of the only ones to be an integral part of. Below is a picture taken right next to my bungalow, back in November 2011, by our Naturalist at the time. So I stepped out of my bungalow this evening with the intention of walking back to the resort. It was barely a 400 meter walk with a Synadenium Grantii fencing (7-8 ft high) for the coffee plantation on one side and open grassland with dispersed trees on the other. Rain bearing winds of the Southwest Monsoons had brought down a heavy downpour earlier in the evening. Even though the approaching darkness started sinking slowly into the forest floor, the visibility was still there, shattered now and then with the interludes of mild showers caressing my face. I thought to myself, “What am I waiting for? Its the same path that I take everyday, so let me just walk it rather than call for a pick up ride from the reception”. So off I went, with long strides to avoid slush and I started using my umbrella as a protective shield against the mild spray that came from time to time. I was barely 50 meters out and as I was just starting to enjoy my walk in the rain, when all of a sudden from nowhere I heard a loud alarm call from the herd of spotted deer that were now right in front of me. Obviously they had seen something that I hadn’t yet! 🙂 And to my horror, the herd of deer started rushing towards my direction. I instinctively ran, and when the deer overtook me, I ran my heart out! Copyright Notice: All the pictures in the blog above are captured by employees of Pratap Jungle Resorts Pvt. Ltd. during their tenure with the company. The company prohibits the use of, reproduction of or distribution of its digital content unless otherwise authorized by the company. I like your website and thought I would share my thoughts with you…it seems to be one of the best resorts in masinagudi.